TUSTIN CHILI COOK OFF WAS HOT! HOT! HOT! 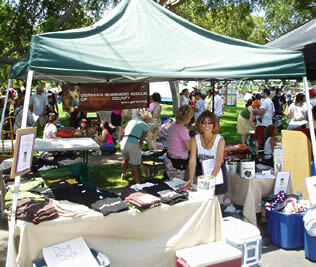 Our cool dogs were hot stuff at the Tustin Chili Cook off last weekend! We were proud to be invited back for our 5th straight year at this fun-filled “street fair” type event. Each year, the event gets better and better. Hundreds of people came out to browse through booths with food, crafts, information and gifts. In spite of the unseasonal heat, we had a great turn out of animal lovers who wanted to show their support and express their appreciation to GSROC for our continued work in the community. We sold a LOT of baseball caps (and WATER!) to raise money for our orphans, and we took lots of applications that we are currently following up on!